Three weeks ago, on 23rd January, we joined a new Slimming World group. We’d been to another group previously but decided we’d move to a Saturday session. Weekends were always a difficult time for us, but coming fresh out of class on Saturday lunchtimes keeps us fired up for the week somehow. I’ve lost 12 pounds in total – 9.5 in the first week, nothing in the second and 2.5 in the third. I’m good with that. The big loss at the start is the most I’ve ever had, so I wasn’t too disappointed when I maintained in week two. Aside from the move to a Saturday session, there are a couple of other things we’ve done differently this time. The plan’s different. More of an emphasis on the speedy fruit and vegetables, and a few syns added to some of the packet meals I used to enjoy. I’m struggling a bit with eating enough vegetables – sometimes because I’m having something that doesn’t lend itself to adding extra veg, and sometimes because I’m simply not in the mood to eat lots. So that’s my big challenge at the moment. We bought two things just as we started. A Nespresso machine and an actifry. We’d had a Nespresso in our room on holiday this year and I decided to invest in one for home. We always have our coffee black without sugar, and it’s great to have a treat that we don’t have to count. It also means we can avoid tempting trips to Costa on Saturday afternoons when we’re craving real coffee. It’s gorgeous, takes up very little space and feels like a proper indulgence! The Actifry has been a revelation. I’ve been hankering after one for years; ever since Slimming World types started getting them and bragging about making chips in them. Well, after years of making Slimming World chips in the oven, this is a whole new experience. It really does work, takes hardly any cleaning and delivers perfect chips every time. I keep promising myself I’ll try something new, but so far that’s been limited to some sweet potato paprika bites and a bit of spicy chicken. But it’s been worth it just for the chips. And then there are the Slimming World meals. I think they’ve been really key in keeping us on plan. In the past, there’d always be that temptation to order a takeaway after a long day at work. Now we have a freezer that’s half full of ready meals that don’t need synning and are big enough to be a full meal – unlike a lot of slimming meals, these ones are really substantial. All of those things have helped, but what’s really made a difference is that I felt truly ready for this. I was feeling fat and miserable for months beforehand, but I knew that I had to wait until I was ready. I don’t know how that comes about or what the trick is, but I just knew that the time was right. Since I started, I’ve stuck to it 100%. No cheating, no black holes. And I’ve not really felt tempted. The next few weeks will be more tricky; we have a meal out this week and I have a conference at the end of the month. But I feel determined to keep powering on. This entry was posted in Progress and tagged Actifry, Group, New Plan, Weight Loss on February 16, 2016 by Louise ASJ. I’ve had a lot of hits here over the past couple of days. We’re all alive with resolutions and intentions. One of mine is to post more here and to have a proper record of my journey – I’ve not written at all for almost a year. When I come across abandoned slimming blogs, I always assume that the person’s given up or given in and abandoned the blog at the same time they abandoned the diet. That’s not the case at all with me; I’ve just been lax with updates here. In 2013, I lost the most weight I ever have. I’m two and a half stone lighter than I was this time last year, even after the excesses of Christmas. I can finally buy trousers from M&S instead of Evans, I have more energy than I can remember and I feel good about myself. Mostly. I could have done far better. Life gets in the way sometimes, and it doesn’t take much to throw me off course. I still have a very long way to go. If you’re reading this and wondering whether Slimming World’s for you, do give it a try. It depends on clean, basic food and a bit of forward planning. But it’s worth the effort. I can create something pretty lovely in less time than it used to take to have a pizza delivered. It depends on following it properly, though. There’s a kind of mysterious alchemy to Slimming World that works perfectly when all the components are there. Not so well when I do it half-heartedly. And go to a class. I haven’t done that enough at all this year. Go to a few if the first doesn’t seem right for you. Find one where you fit and you’ll have the best support, friendship and a very gentle kick up the bum on the weeks where that’s what you need most of all. For so many of us, this is a very long journey. It’s always good to have company. This entry was posted in Progress on January 1, 2014 by Louise ASJ. I managed another three pounds off this week, which I’m delighted with. I’ve also started to notice a difference with my clothes; it might be my imagination, but things are already starting to feel a bit looser. I set myself three challengs last week – more superfree, planning properly and braving a taste of scanbran. I’ve started to do much better with the superfree. I’m still not managing it with every single meal, but I’m certainly giving myself 9 out of 10 for effort! Proper weekly meal planning takes a couple of hours out of Friday night, but it’s well worth it and much better than just opening the fridge and wondering what to have. I’ve not managed the scan bran, though. I can’t quite convince myself to be brave enough. This entry was posted in Progress and tagged Weight Loss on February 9, 2013 by Louise ASJ. Weigh in tonight after the second week on my new burst of Slimming World. I’ve lost another two pounds so I’m through the first half stone (7.5 lbs in total). Truth be told, it’s been nowhere near a 100% week. I had an overnighter at my sister’s house and ate some things I shouldn’t have done (and missed some that I should have had). Nothing major compared to what I was eating a month ago, but I had a 150g bag of licorice allsorts on the Saturday and freestyled a bit on the Sunday. Me being away at the weekend also meant that we didn’t set out a proper plan for the week. I know that we do best if we sit and do that on Friday evening / Saturday morning, and then set up a supermarket order. Not having that meant that it’s all been a bit ad-hoc. I’m very happy with getting through my first half stone, though. Being part of a proper Slimming World group instead of just doing it at home is great. We didn’t stay tonight, but there’s still the discipline of the weigh-in and the familiar faces in the queue for the scales. And the stickers. We don’t get fancy stickers when we do it at home! 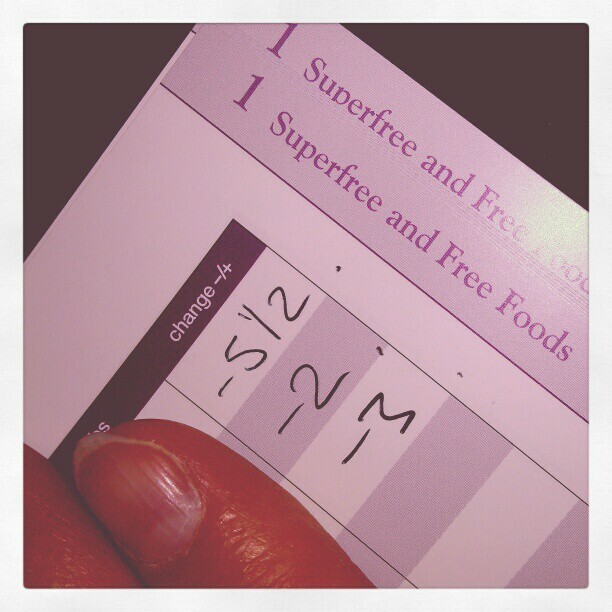 – We need to get to grips with the Superfree thing and make sure we have more of those every meal. – Meal planning. We have quite a calm life, we know what’s coming up for the week ahead and we can have a good week of planned eating. – Scan Bran. We bought two packs of these last week. We just need to take the next step and be brave enough to try eating them! This entry was posted in Progress on January 31, 2013 by Louise ASJ. 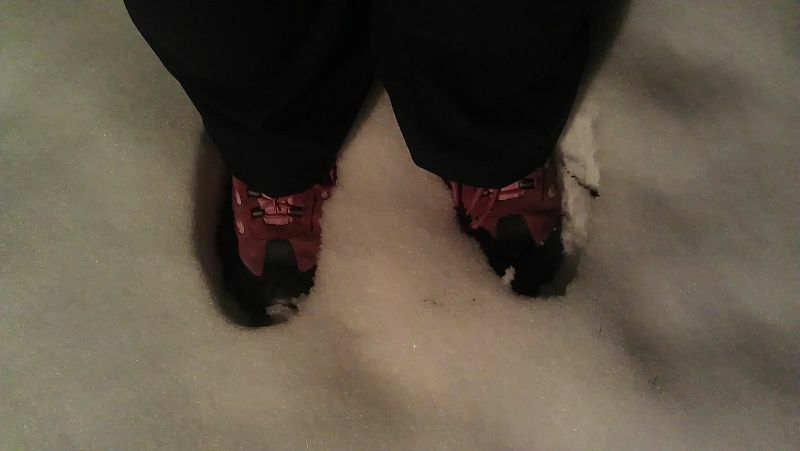 I thought I’d take one of those arty feet pictures this evening, all set off against the big layer of snow in our garden. The sort of pictures that always seem so cutesy and girly. So here are my shoes for today. Chunky and snow proof. I do love the pic, but this is what I’d call a fat pic. Or a ‘before’ pic when I’m in the mood for thinking I really can do it this time. I guess most of us who are travelling the long slimming journey know how to pose to capture us looking as slim as poss. Mine’s holding the camera as high as poss and shooting downwards. Works really well on hiding chins, but not so good for photographing chunky legs. It’s the little things like this that remind me how long this journey will be. But those are the very things that mean I must walk it. Thank goodness for sturdy shoes! This entry was posted in Progress on January 22, 2013 by Louise ASJ. Enter your email address below and we'll send you an email whenever we publish a new post. A Slimming Journey is a participant in the Amazon Services LLC Associates Program, an affiliate advertising program designed to provide a means for sites to earn advertising fees by advertising and linking to amazon.co.uk.